Rope swings need trees, big trees. Many of today's tiny yards have no space for a tree large enough to hold a swing. Heck, many yards today hardly have room for an ugly metal swing-set. Don't give up on trees, no matter how small your grounds or large your acreage. Trees give us shade, clean the air we breathe, and are awe-inspiring in their shapes, small or large. For some reason, trees give us peaceful thoughts and welcome relief from not just heat, but stress. Now is the time to get trees in the ground. If you choose your tree now, you can see what fall color it will wear in your garden. Some maples, especially, can have a range of gold to red to yellow or a blending of all three colors. Choose while the leaves are still on the trees, displaying their fall splendor, to get your best color choice. Look for interesting bark, too. Bark can be beautiful in winter when trees are bare. If you have a small city lot, consider a Trident Maple, Acer buergeranum. It's a small, rather slow-growing tree, 20 to 30 feet high at maturity and almost as wide. It has a nice oval to rounded shape and you can trim it to a single trunk. The bark is an exfoliating gray-brown-orange. The new leaves are often a bronzy-purple, which become dark green in summer. 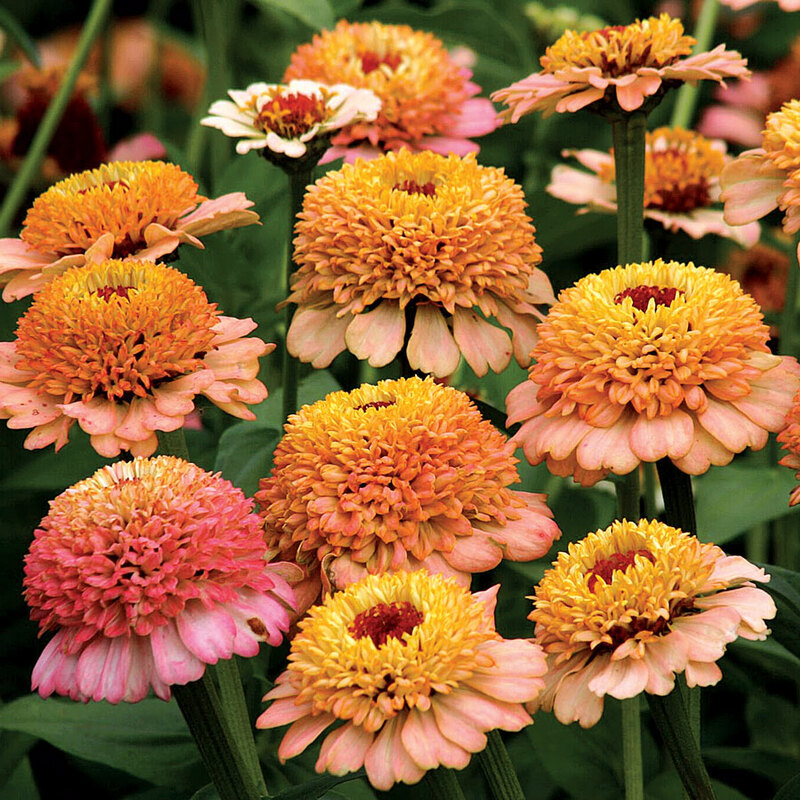 Grow it along the street or patio or even in a pot. It likes a sunny site with well-drained acid soil. Zones 5-8. Backyards consisting of patios do not have to be left treeless. Dwarf Japanese maples make excellent container plants. Use Acer japonicum in cooler climates, zones 5-7; and in zones 5-8 Acer palmatum because it is a little more heat tolerant. Let them grow as they will or try your hand at a little bonsai, with a nip here and a wire there. If you have some acreage, consider two of our native deciduous trees. The sycamore, Platanus occidentalis, grows to huge heights with massive trunks. It likes to grow along streambeds. It has beautiful gray bark, which exfoliates, leaving patches of creamy white. It's a messy tree, dropping twigs, branches, and fruit. It should only be planted on a large property along a stream or woodland where everyone can enjoy its beauty from a distance and where it can be left to its untidy ways. Zones 4-9. The tulip poplar, Liriodendron tulipifera, is another fast-growing native tree that isn't suited for a small landscape. It can grow to 90 feet or more in height. The leaves are a bright green in summer and a lovely soft yellow in the fall. The flowers are small cup shaped yellowish green with an orange center. They bloom high up in the tree and are a favorite of honeybees. Zones 4-9. Pin oak, Quercus palustris, is a fast growing tree that likes moist, rich, acid, well-drained soil. It will tolerate standing water but not a high pH. It can get to 100 feet high, but 60 feet is more normal. Its canopy spreads 25 to 40 feet, allowing it to fit into a larger landscape. Zones 4-7. The white oak, Quercus alba, fits the description of a large long-lived tree that Ken Druse suggests we need to plant. It is, Dirr says, "a majestic and worthwhile tree for large areas… among the most handsome of oaks." It will tolerate a range of soil types but likes a deep, woodsy, acidic soil. Zones 3-8. American beech (Fagus grandifolia) is one of my all time favorite trees. These magnificent specimens, Zones 4-9, hold onto their leaves throughout the winter. The leaves stay an attractive tan color. Spring is definitely arriving when the beach loses its leaves all at once. In a few days, new green leaves are showing and spring has sprung. Plant a tulip tree for shade in a few years. Plant an oak, cedar, or a maple for your grandchildren and their children. Sources: Dirr's Hardy Trees and Shrubs, an illustrated encyclopedia by Michael A. Dirr. The Natural Shade Garden by Ken Druse.